EDWARDSVILLE – The famed U.S. Navy A7E Corsair on display is being lowered from the display pylon by Keller Construction Monday morning at Robert C. Stille Edwardsville Township Community Park. Edwardsville Township Supervisor Frank Miles and other staff are on hand this morning as the plane comes off its display for restoration. Miles said the plane will be positioned close to its present position on the ground for the restoration project. Eventually, a tent will cover the plane and it will be fenced off for security. The restoration should take four to six weeks, Miles said, and it will be placed back on its original place on the display pylon. Robert C. Stille Edwardsville Township Community Park is located at 6368 Center Grove Road, Edwardsville. The aircraft has remained on the pylon since it was originally installed in Township Park by Keller Construction in 1991. 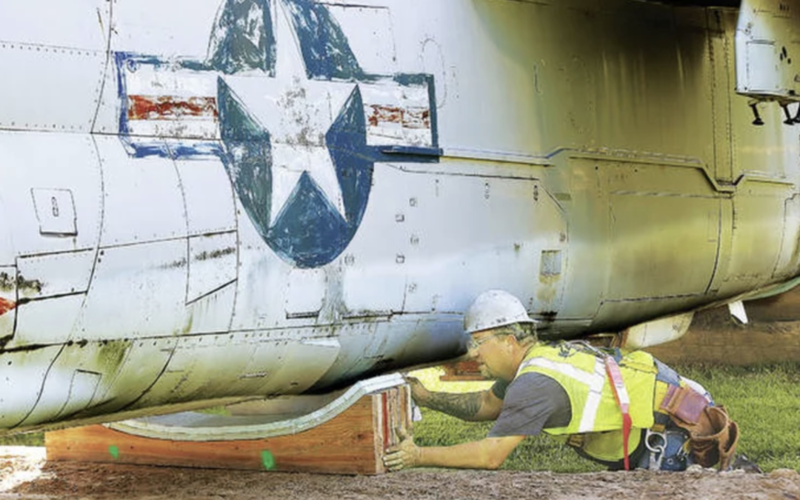 In October, Edwardsville Township approved a contract with the Flight Deck Veterans Group, a nationwide nonprofit organization based in Tennessee for the restoration of the historic aircraft on display at Township Park. The Flight Deck Veterans Group restores aircraft as a part of its mission of veterans serving veterans and to pass on the history and legacy of veterans and flight deck operations.